At the risk of sounding a bit like one of the hysterical teens who started self-flagellating themselves when Take That split up in ’96, I was left mighty despondent when Khanate, surely the best American metal band of the last 12 years, went to the wall in 2009. In a world where even my beloved SUNN O))) have been described as “hipster” (as was explained to me rather vociferously and emphatically by a “proper”—his words—black metal fan I know), Khanate seemed to represent darkened metal at its most aesthetically pure and extreme, channeling a doom tradition stretching back to Black Sabbath via St. Vitus and Dopethrone via the scorched-earth nihilism of black metal without ever resorting to a bland pastiche or cliché of any of the bands they filched from. Above all, in Alan Dubin Khanate had the most extreme, soul-shattering, heart-stopping vocalist metal, of any variety, has ever vomited forth from its black heart. So it’s very pleasing that, after a rather dodgy debut album, 2009’s This Face, Horrible Chamber sees Dubin’s most recent major band, Gnaw, climb similar heights to those he once scaled alongside James Plotkin and Stephen O’Malley. Gnaw promised a lot on This Face, largely through Dubin’s presence and a slightly more varied approach than most metal bands. But the record was hamstrung by the fact that the various band members live far from one another and the album was therefore put together via the exchange of pre-recorded files. By wisely deciding to convene in a studio for Horrible Chamber, at least on the basic tracks, their follow-up packs distinctly more punch and feels overall more cohesive. This combination of group interplay and overdubbing works remarkably well. Gnaw are arguably a more experimental combo than Khanate, despite the latter’s embrace of deconstructed jazz rhythms and thick moments of silence on their last opus, Clean Hands Go Foul. 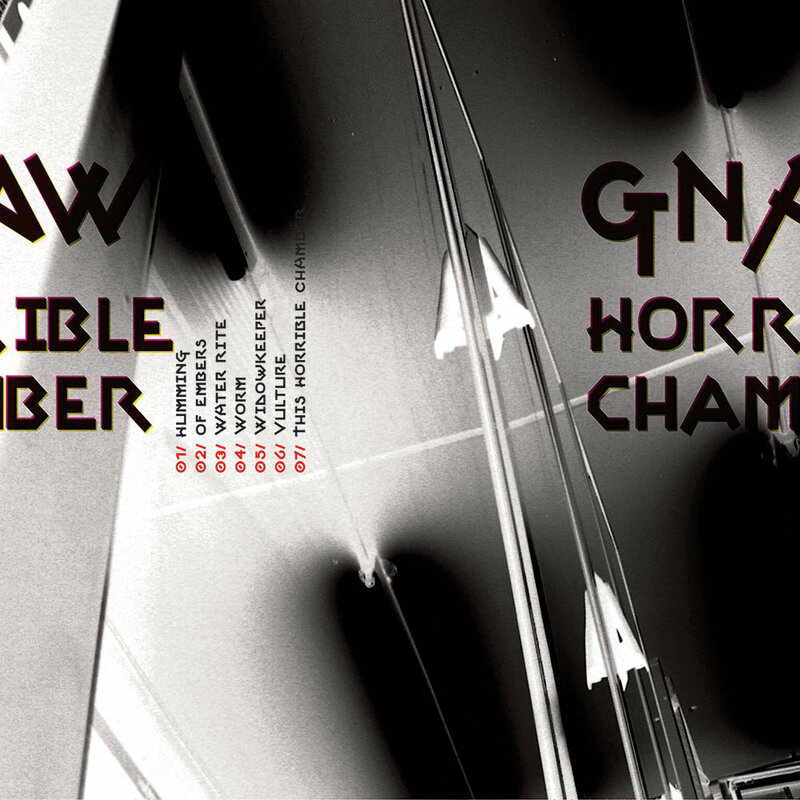 Gnaw’s combination of murderous riffs, sludgy bass, dark ambience and soulless electronica is mastered expertly on Horrible Chamber, resulting in a seven-song suite that pulls in all directions whilst staying wholly cohesive. Many of the tracks have a similarly slovenly pace to latter-period Khanate, but with those aforementioned silences filled with tenebrous clouds of distorted synth noise and ill-defined found sounds. In the middle of this maelstrom sits Dubin, who quite possibly hasn’t ever sounded more deranged and horrific as on Horrible Chamber, which is saying something. His vocal style is based in black metal’s nihilistic growl, but his range is such that he can—and does—incorporate the soaring wail that was the characteristic of metal’s earlier dark messiahs, from Osbourne to the hair metal mob. As such, his range climbs from murky mumblings to psychotic shrieks, coming on like Diamanda Galas with a throat problem, which allows him to go beyond the misanthropic emotions of most black metal singers into something more self-analytical. There are times when, as he sings bleak lyrics of death and abuse (standard fare for black metal), he sounds less threatening than self-loathing, as if he’s channeling the spirit of a man capable of great evil, but is desperately trying to wrench himself out of this hideous psychological abyss. There is no exploitation in even the grimmest of Dubin’s narratives, more a bleak and unflinching examination of the seething, seeping black heart of humankind. Around Dubin, riffs churn and bass lines threaten to flatten entire cities with their magnitude. Gnaw are hard to define along traditional metal criteria. At times, it sounds like your bog-standard metal band, all chugging riffs and blasted back beats, and these are its weakest moments. But at others, as the guitars recede to be replaced by harsh electronic noise and slabs of musique concrète, and Dubin appears to be howling into some crushing metallic void, the whole concept of metal song-writing goes out the window, to be replaced by something more abstract and alienating. Laziness will convince many to label Horrible Chamber “industrial metal”, but even that broad epithet doesn’t do Gnaw—and Dubin—justice. Maybe this is metal as dark, broken poetry, a sort of unhinged space where anything goes so long as it feels like it’s pounding into your heart. This entry was posted in 2014, Dusted, Music Reviews and tagged Alan Dubin, Dark music, drone, Dusted, electronic, experimental, Khanate, metal, noise. Bookmark the permalink.